There are two main causes of fire in bush country – man and lightning. Gosford heard stories from the native peoples of birds dropping flaming or smoldering sticks to start fires and decided to investigate further. 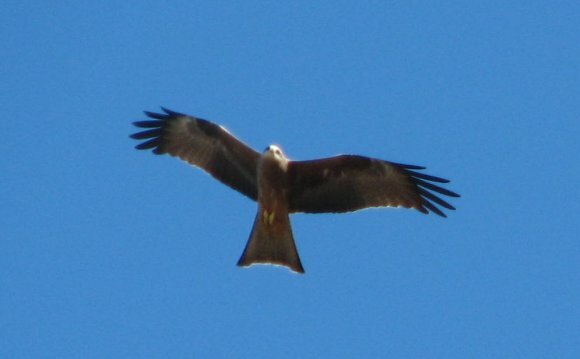 He found that the birds of prey mentioned most often performing this act of arson were black kites (Milvus migrans) and brown falcons (Falco berigora). To confirm this, Gosford interviewed firefighters and park rangers and found several firefighters and 14 rangers who had witnessed acts of flying arson. The witnesses say the birds were able to fly as much as 46 meters (150 feet) without burning themselves or losing the flame. After dropping the stick and starting the fire, the birds waited for panicking rodents, frogs and lizards to evacuate the area and end up as dinner. Have these birds really evolved to using flaming twigs as tools and become the only creatures other than man to deliberately start fires? It’s possible, says predatory bird expert Dr. Steve Debus from the University of New England. I think black kites and brown falcons are sufficiently intelligent to intentionally spread fires by dropping burning embers, because black kites have been seen to drop bread scraps from picnic areas into nearby waterholes to bait fish within striking range. So where are the photos and videos of these fire-setting flyers? There don’t seem to be any. Gosford is looking for this kind of concrete evidence for his research, along with stories and evidence of similar behavior by raptors in similar fire-prone areas in Africa and North America.